Network automation saves the IT department a lot of work, since it automates recurring tasks. Municipalities or small telecommunications carriers can also profit from this. 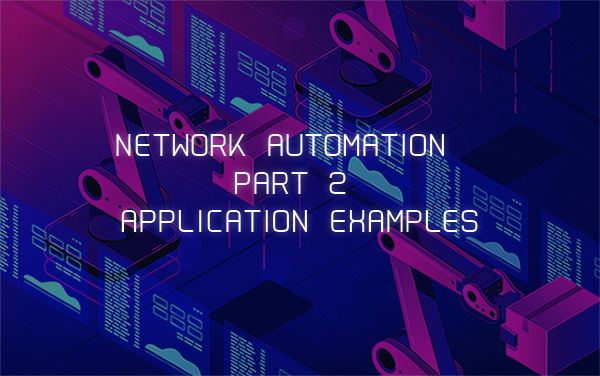 The second part of our blog series on automated networks describes two typical real-life case studies. Automated networks offer significant advantages in data centres. Schools, public authorities or small businesses can also profit from them. Two examples of typical application scenarios for automated networks used by our customers demonstrate why this is the case. The first example concerns the network of a high school close to Munich, which can be used as an example of networks for schools and also municipalities. Challenge / situation: As in many schools, and also in public authorities, the network at our example high school consists of around 30 switches. These are in part configured differently, since the network connects individual workplaces, classrooms and PC pools with each other. They also supply Wi-Fi access points with network connection and electricity via Power over Ethernet. The network components are not managed centrally; the administrator must complete all tasks manually. However, neither the schools nor the municipalities have sufficient IT staff, let alone highly-qualified network experts. At schools, the system administrator is often a computer science teacher; in smaller public bodies it is generally a member of the computing staff who acts as an all-rounder, taking care of all the IT equipment, whether server, network, printers or the software. The school’s objective was central control of the network and to simplify administration and (partially) automate it. Solution: To achieve this goal, the school installed special software for administrating the devices centrally. The software’s user interface shows the devices to be managed, with important information such as IP address, software status etc. Furthermore, the interface permits a configuration to be rolled out centrally, for example, if the school introduces a new VLAN. Groups with identical devices are also possible. If a security vulnerability is discovered, the administrator can install the appropriate security patch on the various devices – centrally and automatically. So it is possible, for example, to test an update on one device and, if it works, use a timer to initiate installation on the other devices during the night, so that normal operation is not interrupted. Another useful function: If a network device breaks, the school can use the administrative interface to send the appropriate status data directly to the manufacturer, and to order a new device. It is also possible to exchange the device proactively on a guarantee basis if, when conducting a health check, the administrator discovers that some parameters (temperature etc.) do not meet specifications (indicating that the device could well break down in the near future). However, additional licences and a maintenance contract are usually necessary for this service. Benefits: With the new solution, the school saves a lot of time and effort in the administration of its network. Those responsible can install important updates quickly, configure all devices – or at least groups of devices – identically, reduce the likelihood of errors and ensure a higher level of safety. After the successful project, the local authority now intends to equip its other schools and administrative offices with the solution, in order to manage its entire network centrally and automatically. The second example describes a smaller telecommunications carrier which supplies its customers with telecommunications and internet services via a routed IP-MPLS network. Challenge: The telecommunications carrier wishes to connect lines on its network for certain customer services, e.g. for networking company subsidiaries via a VPLS tunnel. Despite the complicated configuration work on the MPLS network, these connections must always be faultless, always run with an identical configuration and be fully documented; so that every employee in the four-person IT operations team is able to manage the network and its topology without making mistakes. At the same time, it should be possible to respond quickly to adaptation requests from existing customers at any moment – to be able to react efficiently to new orders as well as cancellations of customer lines. Solution: The carrier’s IT team now uses a new software tool (which is on a central virtual server) to specify the endpoints (UNI) in the MPLS network just once, and to define the quality requirements (QoS) for the individual services: which service and what bandwidth etc. is needed? There are uniform templates for this which are stored centrally in the system. All steps or changes are then rolled out automatically and documented. Furthermore, it is possible to return to an earlier status. If a customer needs a higher bandwidth for a service (for an event with live streaming, for example), the IT department can prepare the new configuration data and then roll it out automatically for all components. Subsequently, it is possible to go back to the original bandwidth without additional activities or configuration work. In future, the carrier could then also offer this service as an added-value service. It is conceivable that, for example, a customer could use the web interface to increase the available bandwidth for one day once a month. Additional fees would be charged for each further increase. Benefits: Thanks to automation, even a small IT team can manage a complex network efficiently. Requirements are defined just once in the templates, and then rolled out across the appropriate configurations. The next two articles in our blog series will examine SDN and the challenges arising from automated networks. The article „Network automation – an introduction“ is already available.